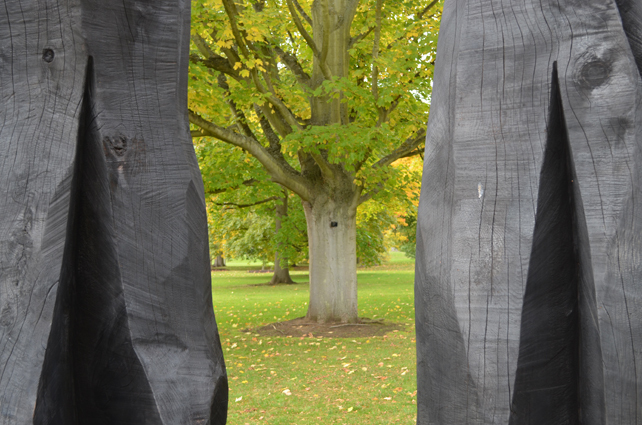 Wonderful David Nash sculptures at Kew Gardens. Autumn is truly upon us and I have been busy squirrelling away new work and spending far too much time writing proposals and funding applications. Rachel and I heard that we have been invited to America to give a paper and a glass painting workshop to the American Glass Guild in Florida in May 2013. This is mega exciting for me as I have never been to the States and I have begun to make so many artistic and personal connections there since I began working with glass. Unfortunately the honour does not come with any funding attached, so it is taking quite a bit of my time to fund-raise for the trip. To that end Rachel and I are holding a Studio Sale of our work at my gallery from 23rd-25th November. There will be an opening event on Friday 23rd from 7pm and you are all invited! I will be offering 20% discount on all framed work and will have a selection of unframed sketches and studies from £45. We will be making glass Xmas decorations and producing Xmas Cards of our work. Come and join us for a glass of mulled wine on the night, or pop in over the weekend. 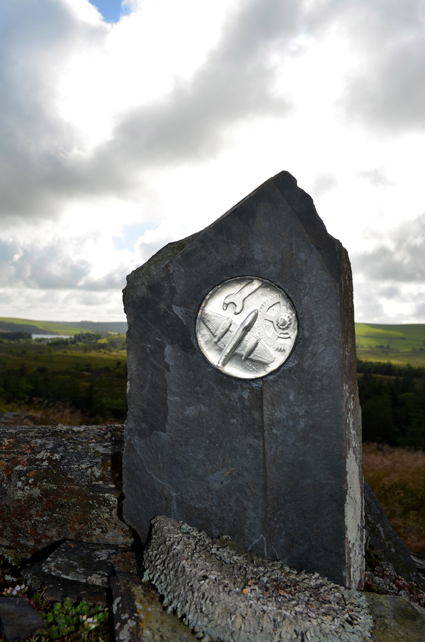 I am also organising a preview for my Cân yr Oerwynt project in Rosebush with Sarah Harman. This event takes place 4-6pm on Sunday 11th November at The Old Post Office in Rosebush. Sarah has written a suite of songs about the history of the village and the human shaping of the landscape and I will be showing my ceramic, slate and glass sculptures and some of the historical material I have unearthed. If I don’t loose my nerve, I will also be singing one of the songs with Sarah and friends! Aside from all this organising I have been exploring some of the Bronze Age archaeological excavations that have been taking place in Pembrokeshire this autumn. This is all part of my project based on the human shaping of the landscape and I am spending a good deal of time thinking about how I am going to work with all the material, how (and if!) to work glass and paint and how to take the whole thing forward in a coherent way. 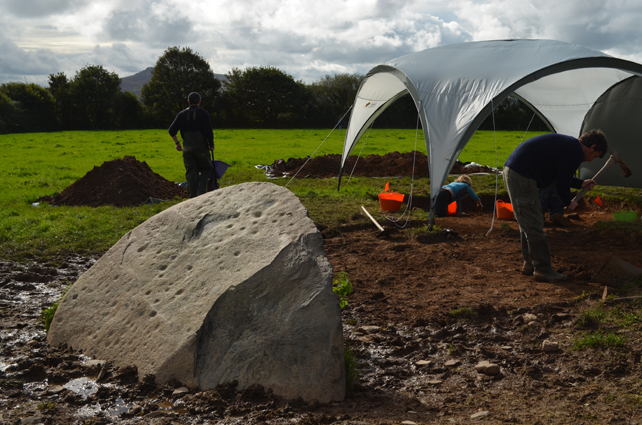 A very interesting dig at the Bronze Age Trefael Stone undertaken by Bristol University and the Welsh Rock Art Society. You can clearly see some of the 75 cup marks on the stone. This is a very creative and exciting time for me. The symposium at Northlands in July gave me space and context to consider things, to contemplate the relationship between my painting and my glass work and to wonder if maybe two dimensions isn’t all bad! Another fantastic thing to come out of my time at Northlands is my friendship with Emma Woffenden. At Northlands we spontaneously collaborated in making work based on figure in landscape, we want to continue our collaboration and I have just spent time with her in London seeing exhibitions and talking about our work and projects. Collaboration with Emma Woffenden in Caithness. 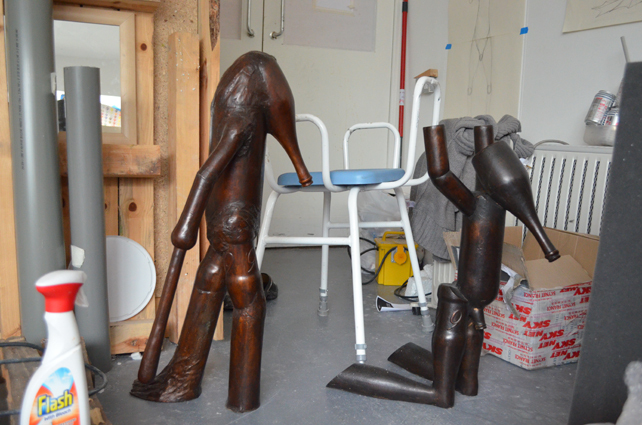 Emma Woffenden’s studio showing her sculptures: ‘Elephant’s Revenge 1’ and ‘Elephants’s Revenge 2’. 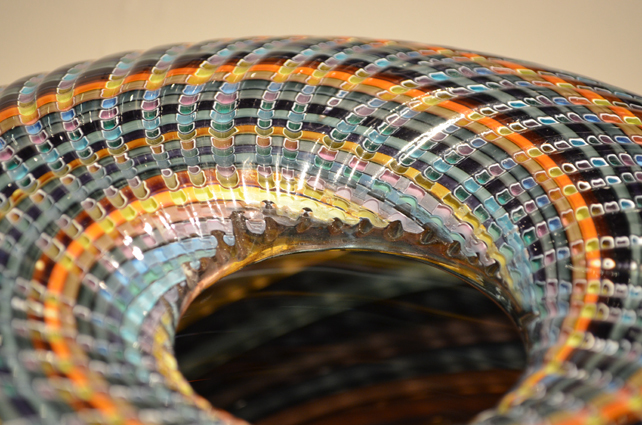 Whilst in London I went to a fantastic glass show celebrating 35 years of glass making at London Glassblowing. This show is curated by Cathryn Shilling and is beautifully laid out in London Glassblowing’d new venue on Bermonsey St. near London Bridge. This piece is an incredibly skilled piece by Layne who pulls canes of clear glass which are encased in a thin layer of white and coated in colour (if he lived in Wales he would surely be called Layne the Cane! 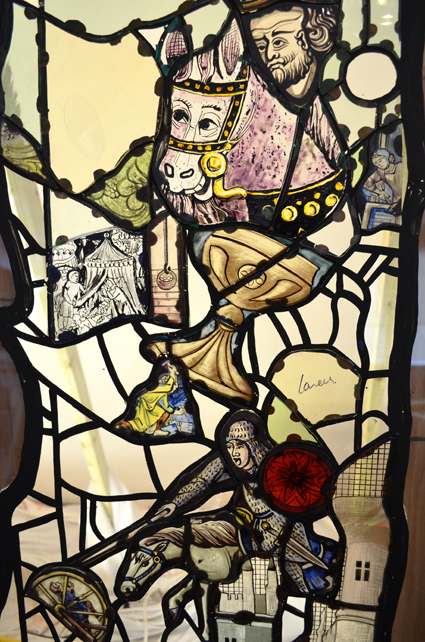 ), he then lays these side-by-side and picks them up on hot clear glass on a blowing pipe, he then blows the whole thing, and cold works the finished piece with a copper wheel to reveal the inside of the canes…madly intricate work. I ran a weekend painting course at my studio this autumn. Thanks to my students who threw themselves wholeheartedly into working expressively and trying out new ideas. 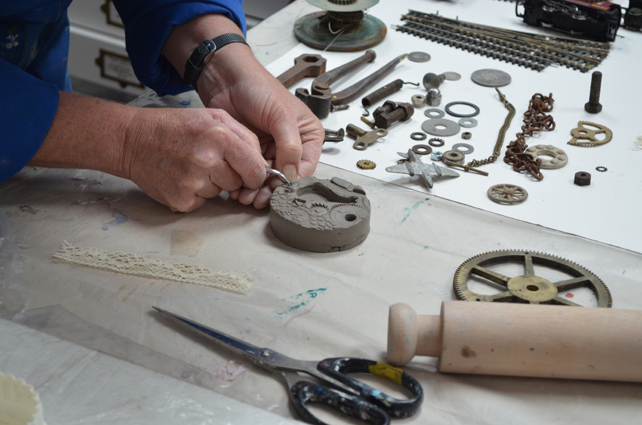 My next course is in February, information on my website. 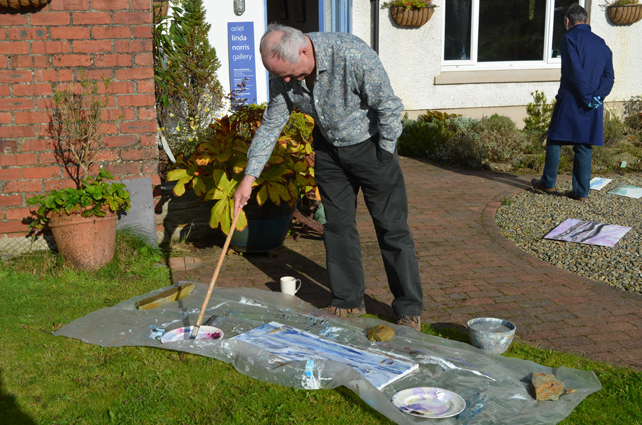 Chris getting into his stride on my painting course. Finally, I have been to some excellent exhibitions recently. One of the most moving was the extraordinary pairing of Celia Paul with Gwen John at Pallant House Gallery in Chichester. Although both artists are separated in time by around 80 years, they have a lot in common as both being strong and quiet artists who make deeply personal, spiritual work. It is a beautiful exhibition, well worth the trip to Sussex. There is also an inspirational Dubuffet exhibition upstairs, which is particularly relevant to the venue at Pallant House as it has a very active commitment to supporting non-traditional artists. 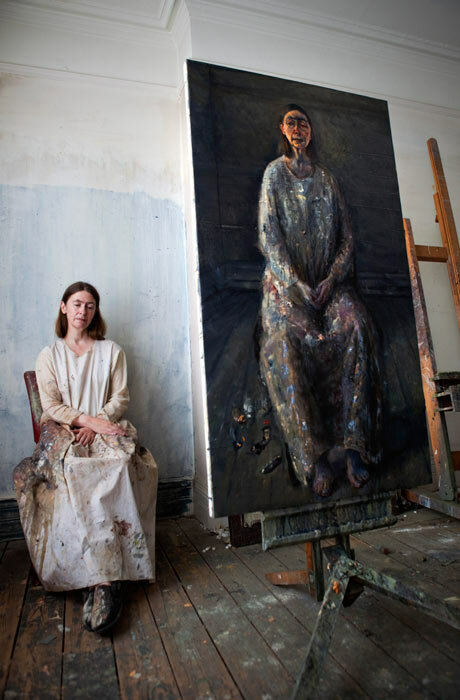 Celia Paul in her studio. Taking glass into the landscape. I am just back from a fabulous fortnight with glass artists at Northlands Glass Centre in Caithness, eight hours north of Edinburgh by train. On the way north I stayed in Fife with my sister and we went to Jupiter Artland, a summer sculpture exhibition in parklands on the edge of Edinburgh. It was fabulous to see sculptures in the landscape, I especially liked the Andy Goldsworthys and Cornelia Parker. The night before I went up to Caithness we met up with Michael Rogers who taught me on my masterclass at Northlands last year and went for dinner with Jeff Zimmer, his partner, Mark, and dynamic glass artist Carrie Fertig. It was great to catch up with everybody, Jeff and Mark were perfect hosts and excellent cooks, and their flat became a tardis and expanded to accommodate us all! Thanks to Tina for the photo. 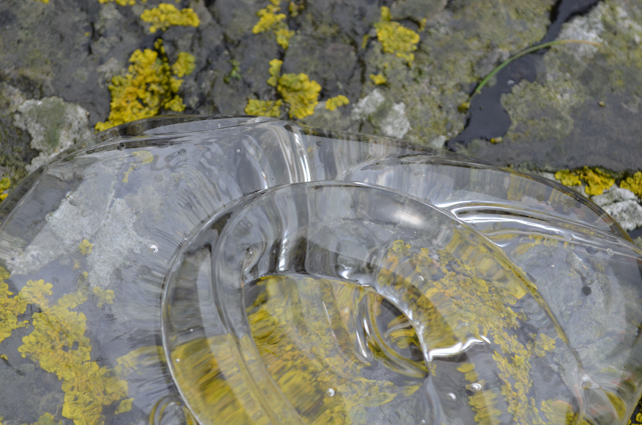 Exploring glass in the landscape in Caithness. My time in Caithness was my prize in the Warm Glass Competition. It was an amazing experience to be part of a group of artists from around the world and to have time and space to reflect on my work. 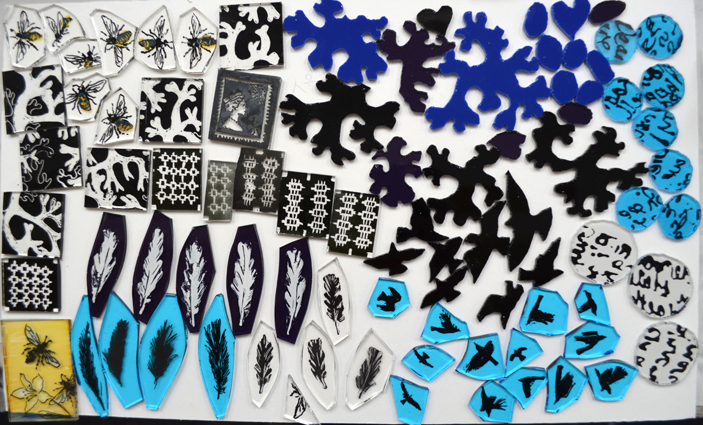 I ended up collaborating in surprising ways with Emma Wooffenden, a contemporary artist based in London who works in glass. 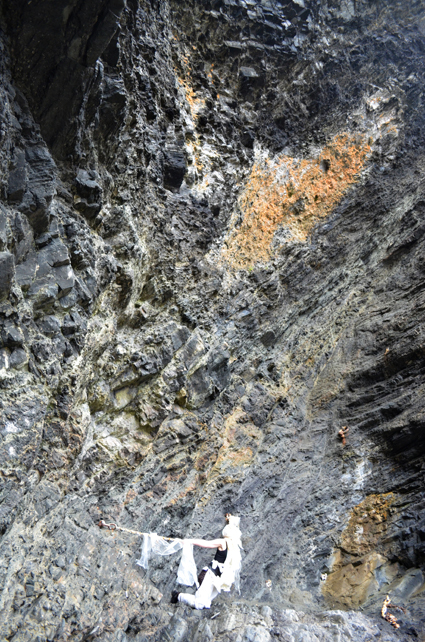 Our collaboration started out with me helping her to document some work she was doing based on ideas relating to the figure in landscape, and ended up as more like a shared performance piece on a beach 365 steps down from the cliff top at Whalligoe. Having time away from my usual practice has allowed me to think about how my painting relates to my glass work and how I could combine the two in the future. Maybe two dimensions isn’t all bad after all! A cast Bullseye glass, knitted copper wire and Lybster pebble piece I made at Northlands. It was an intense period of work and a brilliant opportunity to share ideas and get feedback on my work from an immensely talented and experienced group of artists. The symposium was organised and facilitated by Jane Bruce, an internationally well known glass artist who lives in Manhattan. 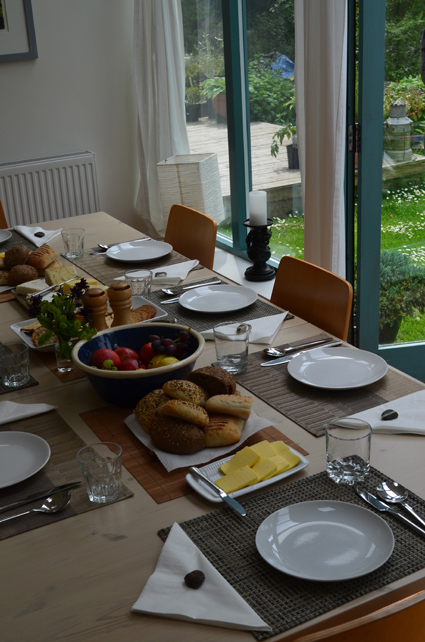 The food, as ever, was fabulous and we were well looked after. The weather was less than endearing, but, then I am used to a bit of rain! 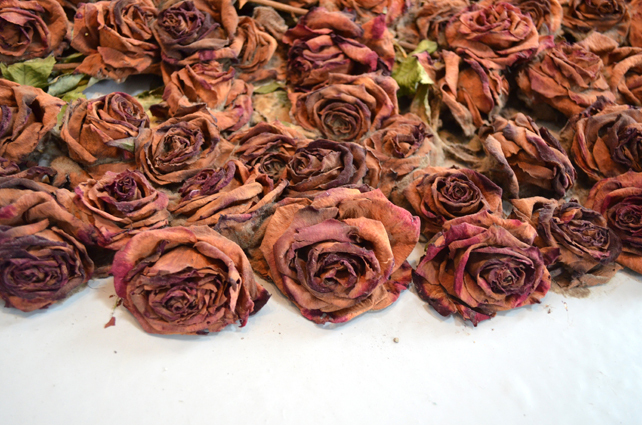 Now that I am back home I have been photographing some of the sculptures I have been working on for my (Arts Council of Wales funded) Rosebush project. It is really exciting to put the work in the landscape and see my ideas coming together. I am looking forward to having some time in my studio! Having finally got some of my slate pieces out to the quarry and with the kiln cooling with the latest Rosebush piece inside, I am headed north to Lybster in Caithness to have 9 days to play with glass as my prize in the Warm Glass competition. I am having a few nights in Edinburgh staying with my sister enroute, and hooking up with some glassy friends on Monday, before embarking on the 8 hour journey to Caithness by train. I will be away from home for two weeks. That piece will be well annealed by mid July! I am looking forward to having time, facilities, materials and space at Northlands to experiment with ideas and make work inspired by the landscape, alongside an exciting bunch of glass artists from as far afield as Sydney and Portland. Scarey and exciting to be part of this. I can’t believe I have come so far (and ended up in the same place!) in less than a year. Last year I remember a sinking feeling after the Northlands conference of “what the hell am I doing?” when I listened to a tired and disillusioned glass artist sharing her perspective on life as an artist working with glass. Actually, I cried, to be so far out of my comfort zone, to be taking such risks as a painter entering a new field, an artist meeting craft. And what a journey it is ! I am constantly surprised by how long everything takes, Rachel smiles wryly and says “welcome”! The medium imposes this discipline on my unruly ideas, which is just as well. 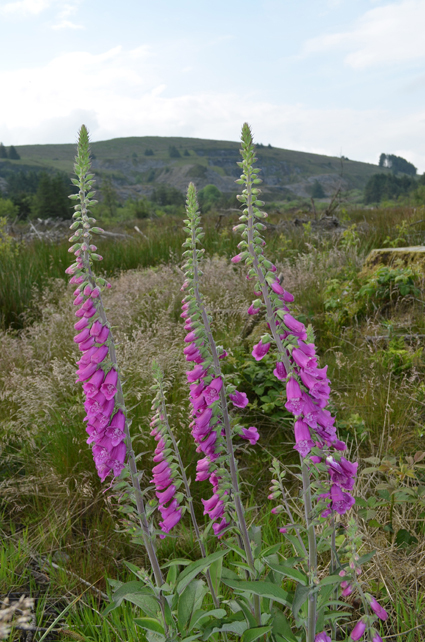 Its June in the quarry, and the period of my Welsh Arts Council research grant is coming to an end. I have been burning the kiln at both ends to finish some cast glass pieces and consolidate my research, and put all the oral history tapes, sketches and photographs in some kind of order. Sarah Harman is working on a wonderful suite of songs using some of the threads and stories we have uncovered. 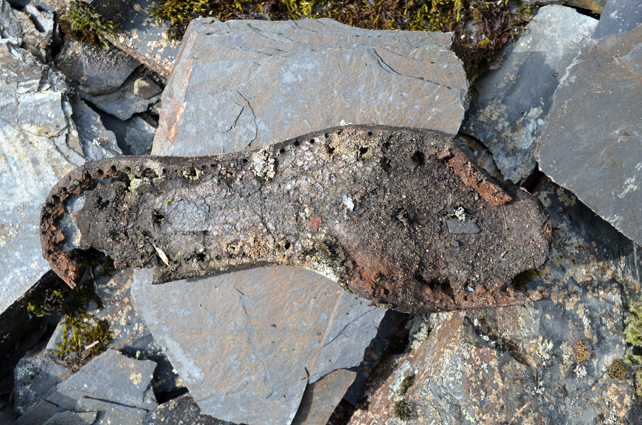 I am still unearthing (sometimes literally!) the secrets of this place, and am awash with ideas and sculptural possibilities. It is a kind of cultural archaeology, and I love that. This research is a real gathering, and is giving me the opportunity to explore lots of ideas and try things out. 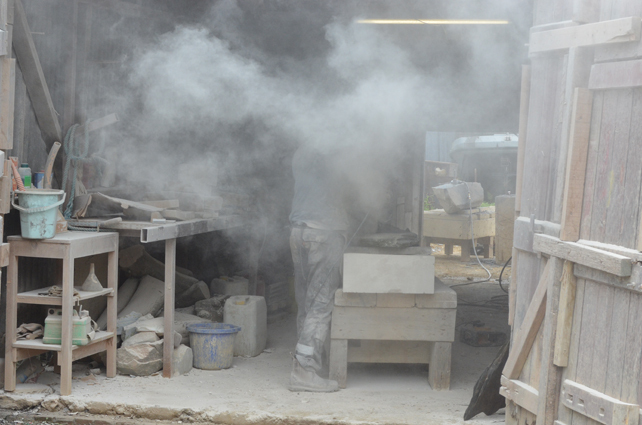 I have also been to the studio of Darren Yeadon, a stone sculptor who lives in Goodwick. 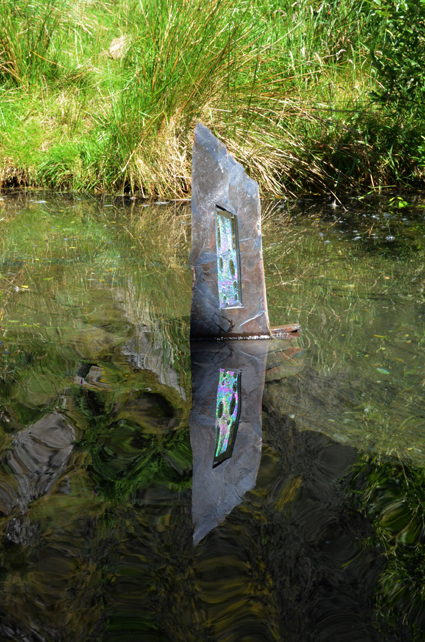 Darren has been pondering the possibility of putting some glass into his work,and has just completed a stone sculpture of a fragment window, so in some ways our work has been following similar paths. 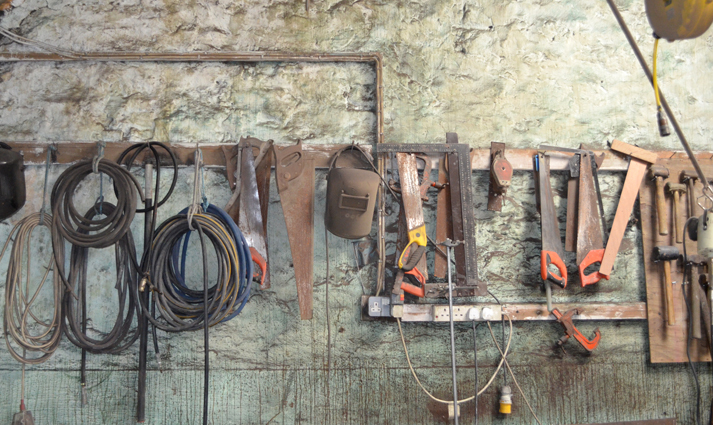 When I got in touch with him to ask if he could cut some slate for me, he was glad to oblige and we have agreed to do a skills exchange, and who knows, maybe we will even collaborate on making work some day. 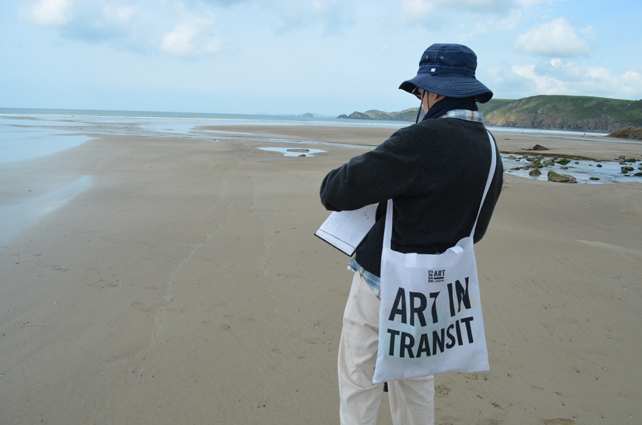 I also heard this week that the Welsh Arts Council have awarded me a training bursary to cover my travel expenses to Northlands Glass Centre and to pay for me to attend the Glass Biennale in Stourbridge and a masterclass at the International Festival of Glass in the Midlands with pâte de verre master Antoine Leperlier. I am very grateful for all this support – it is going to be a very exciting and busy summer! From Rosebush to Newgale (via Clunderwen). Work is coming along on my ‘Can yr Oerwynt’ project (funded by the Arts Council of Wales) based on the history of Rosebush, my neighbouring village. 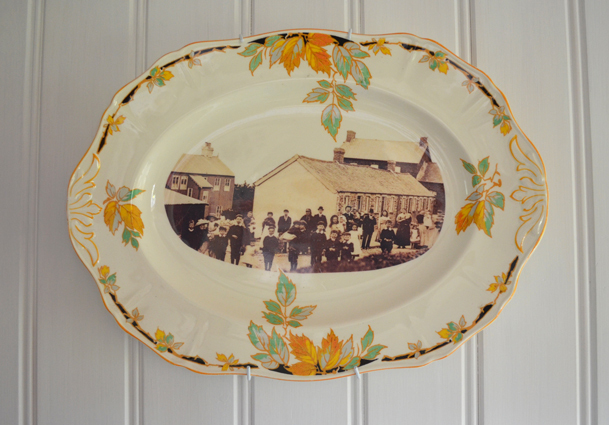 I am working on ceramic decals and experimenting with firing imagery onto old plates in preparation for an installation I am planning as part of the project. I had a fantastic visit to Martin Bellwood‘s foundry in Clunderwen to discuss getting Martin to make a “plinth” for my glass work for the Rosebush project. 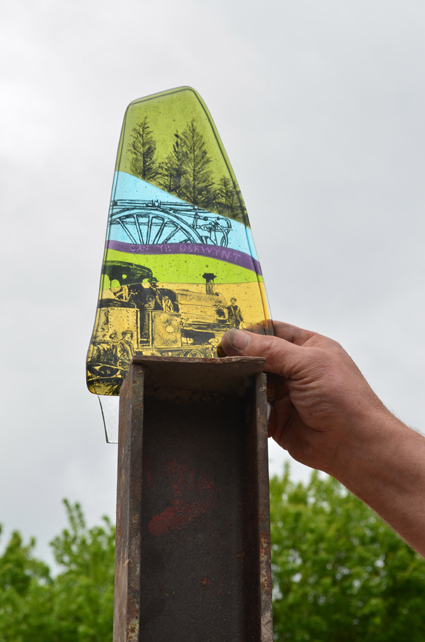 It was brilliant to begin to put glass together with metal and other materials in his workshop and to see the possibilities for combining media and collaborating with another artist. I am so lucky to have Martin just around the corner – people travel a long way to work with him. He certainly knows his materials and our discussion opened up all kinds of possibilities which I hadn’t really considered. I am thinking of using industrial iron as the basis of the plinth, to reflect the industrial nature of much of the history of the Rosebush Quarry and railway. 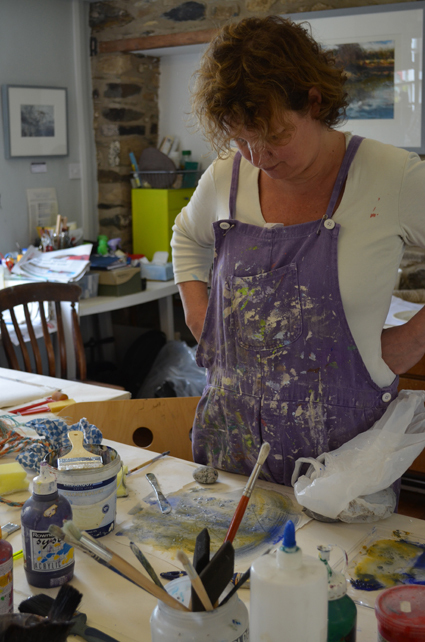 This weekend I am teaching a painting course near Fishguard at Indigo Brown. 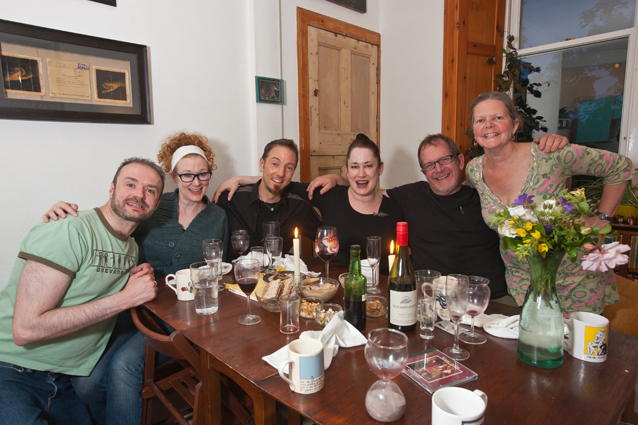 I hire Indigo Brown a couple of times a year as a base for my courses, Maggie and Andrew are the perfect hosts, they seem to think of everything, and we are very well fed by Andrew, who is great cook. I am running an autumn course here (October 4th – 7th) and there are still some places left if anyone is interested! The students are all getting stuck in and are engaging with the theme of breaking out of their habitual ways of painting and seeing. Newgale beach was wonderful this morning at low tide with lots of interesting detail, shifting light and miles of wet sand to keep us happy. 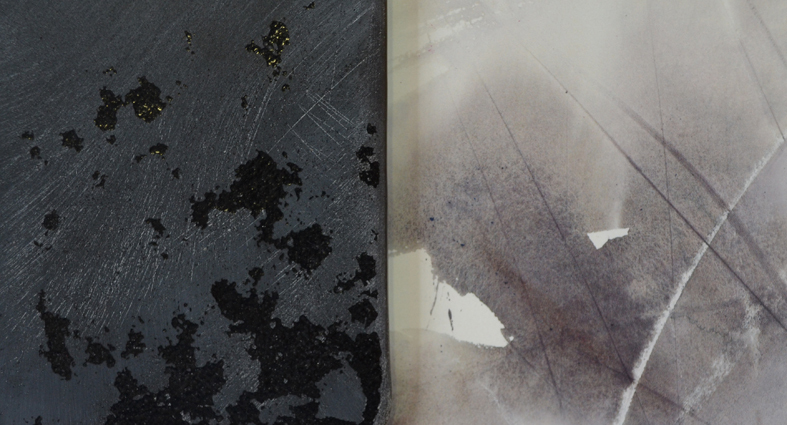 We are working in the studio with wax and sand and other textural materials and concentrating on mark making and exploring new ways of working. 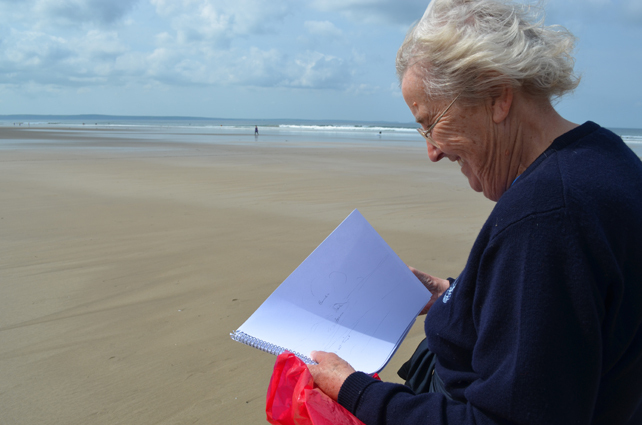 Jane sketching at Newgale…where did she get that bag?! Sam pondering in the studio. The past few weeks since installing the Conwy windows I have been settling down to new projects and picking up the Rosebush Quarry work. I am beginning a collaboration with a glass blower in Japan, Kaori Maeda. Kaori and I met in 2008 when she was working at glass studios in the UK and have kept in touch ever since. 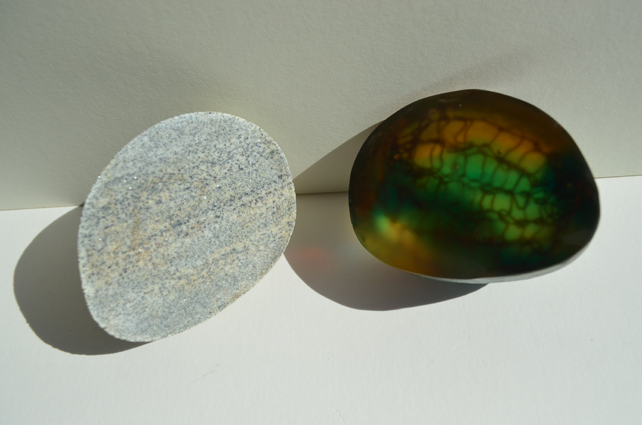 I have made small pieces of decorated glass which I have mailed to her to use in her blown forms, and she has sent me some blown forms which I have begun experimenting with. We are in the process of applying for funding to work together in Japan and UK, but for now this is one way of actually getting started and trying out our ideas. It is far from ideal to be posting glass across continents and Skypeing across time zones, but at least it is a beginning for us. “Can yr Oerwynt”, work in progress. I have also been getting down to some serious research on my “Can yr Oerwynt” project for which I have a Research and Development Grant from the Arts Council of Wales. Because the Conwy project has taken almost all my time since September, I have had an extension on my deadline for this work to the end of June. Together with singer/songwriter, Sarah Harman, I have been interviewing older local residents who remember the North Pembrokeshire Railway coming to these parts and who have family stories going back centuries. Gathering photographs and documentation from the County Archives as well as recording personal histories, I have begun work on making a series of small glass pieces as maquettes for larger work which I would like to do in the future. 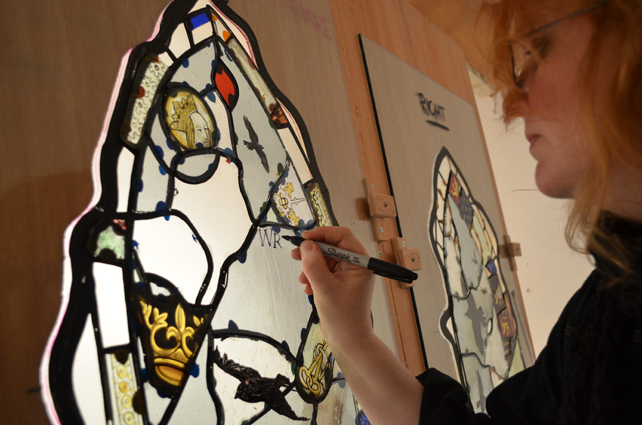 It is good to get engaged with the glass and to begin to get some of these ideas down in the studio. 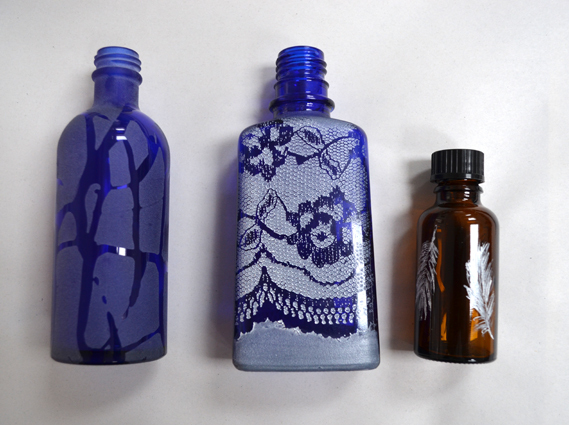 In preparation for these and other projects I have been experimenting with sandblasting and enamelling glass bottles and am really enjoying finding out what I can do with these techniques, recycling freely available glass at the same time. Do get in touch if you have any interesting or coloured glass bottles you do not need! 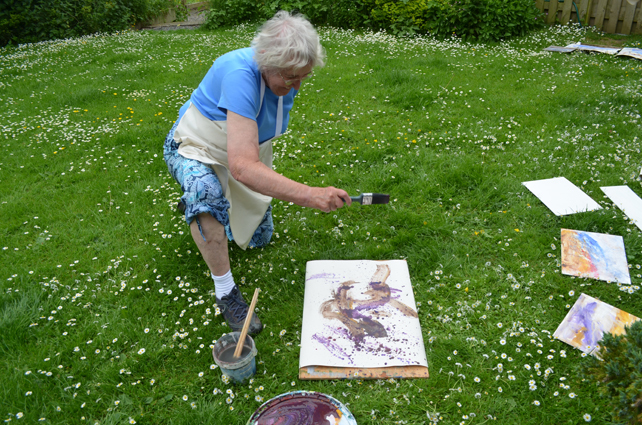 This week we had a visit from Kathryn Campbell, an artist based in Carmarthenshire who trained as a calligrapher. We have been searching for a calligrapher who can work with us to incorporate the beautiful couplets written by Damian Walford Davies in the windows. Kathryn is an artist I have known about for a while but had no idea she was a talented calligrapher, and, what’s more she is excited about our work and able to fit in to our tight deadline! Incorporating the poems in the windows needs careful thought and we have gone through a number of options and approaches, finally we decided we need to commission a calligrapher in order to do the work, and the poems, justice. The painting is coming along well, we need to get all the glass painted and delivered to Swansea in a fortnight’s time for leading in order to comply with our installation date of March 8th. 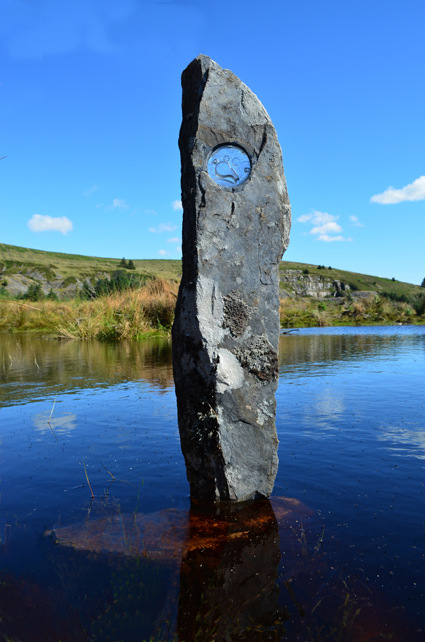 I took a day in the week to work with Sarah Harman on our Rosebush Quarry project “Canu’r Oer Wynt”. This is a project I began in the autumn supported by a research and development grant from Arts Council Wales. 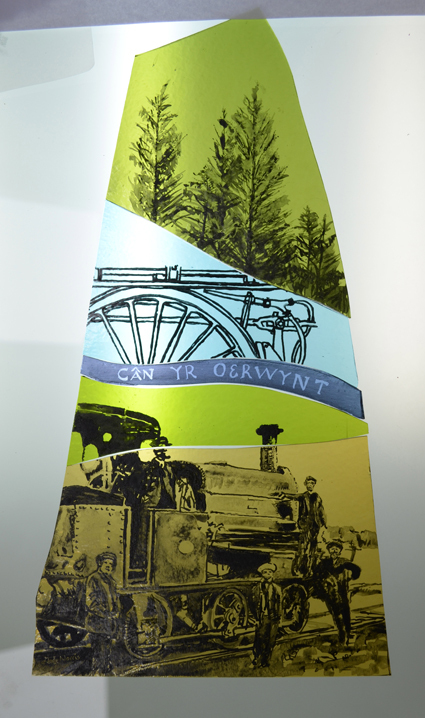 I have been researching in archives, interviewing local people and experimenting with some glass ideas in my kiln, but since November the project has taken a back seat because of the Conwy commission. Sarah is a singer/songwriter and talented choir leader who is planning to write a suit of songs based on the history of the quarry, together we interviewed local people who remember the railway in Rosebush when it was operational, Peter Claughton, an industrial archaeologist and Geraint Harries, a friend and local man who works for The Pembrokeshire National Park Authority. We recorded the interviews to form the basis of our research for our project and discussed our ideas and plans. It was good to get back into this project. 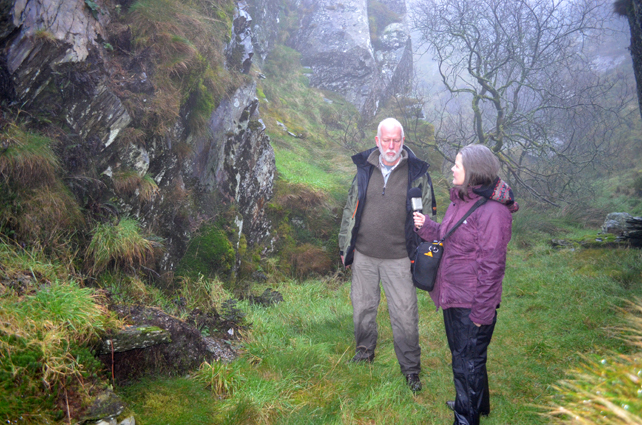 Recording an interview with Peter Claughton in Rosebush Quarry.